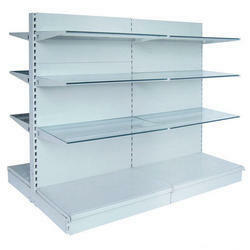 Adarsh Udyog is a trusted name, engaged in manufacturing and supplying a wide range or custom made Chemist Racks. We are manufacturing beautiful range of Cosmetic Racks. 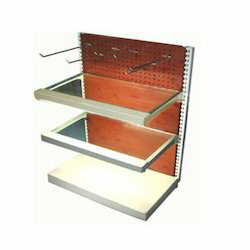 These racks are used to display cosmetic items in retail stores and other commercial areas. These are manufactured by our trained fabricators using best quality raw material and latest technology. These racks are designed to give a glimpse of cosmetic range available with eye-catching designs. The complete collection is available in various colors, trendy designs and sizes in order to fulfill the demands of our clients. Cosmetic Racks have glass shelves that make the products to be viewed easily without touching.The Retail stores beauty counter Cosmetic Rack should be: eye-catching, organized, well lit, and above all, the Cosmetic product is displayed where it is accessible for the customers to see it. 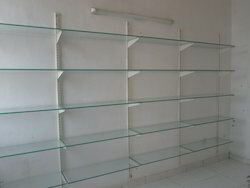 We are Manufacturers and Supplier variety of Retail Store Cosmetic Rack commercial design, but one of the most important difference in Adarsh Udyog Cosmetic Display Racks is Latest Design using high Quality Raw Material and Glass Shelves which Makes them Elegant in Look as well as longlife. The Retail stores beauty counter Cosmetic Rack should be: eye-catching, organized, well lit, and above all, the Cosmetic product is displayed where it is accessible for the customers to see it.